Another epic leg of the journey is in the books, and as I recline back in our new apartment, freshly bathed, staring out over the Quito nightlights, Bibi at the kitchen table editing photos, I can´t help but be in awe of what we just accomplished together. 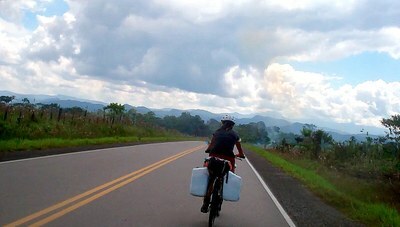 In about 5 weeks, we crossed some of Peru´s highest mountain passes on single lane dirt roads with fully loaded bicycles. And as Bibi pointed out as we sat down reviewing photos and videos from this part of the trip, we were smiling the whole way. 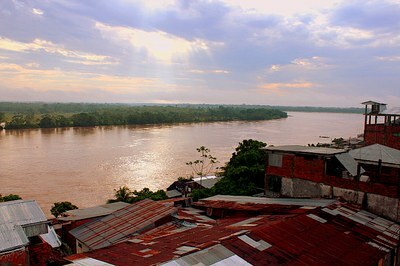 Although the boat trip from Iquitos to Yurimaguas hadn´t taken nearly the physical toll on us as the Pantoja-Iquitos ride had, I was still struggling mightily with a stomach bug when we pulled into port after 4 days on the river. We unloaded the bikes and gear, and walked them alongside Maren into the center of town to find a hotel for the night. After grabbing some Chinese food together, the ladies traded photos and contact information in our hotel room while I got to work on some bike maintenance. Brakes needed adjusting, tubes needed air, and gears needed cleaning and lubing. I took the bike out for a test ride as the sun was setting on the river, and began to gear up mentally for the trip ahead. After 3 weeks traveling by riverboat, I was ready to get back in the saddle. That night was our final night with Maren, and we decided, without a great deal of gusto, that drinks were in order. We stumbled down to the docks, only to share a single overpriced beer as we were mauled by mosquitos. We were the only patrons of the bar that night, and took liberties mocking the jungle music and dancing that was being played for us on TV. If anyone remembers Tunak Tunak Tun, imagine it done by Peruvian girl with a hoop dress. It was both terrible and irresistible. We had some good laughs before fleeing the mosquitos for a nightcap of ice cream. The next morning, Bibi and I set off early. 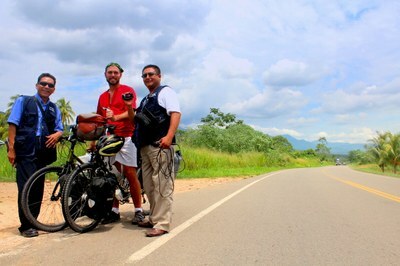 Google told us Tarapoto was 96 kms away, and we were hoping we might accomplish it in a day. The first sign we saw leaving town told us otherwise, and we allowed ourselves to fall into a natural pace. It would be at least another day before we got to Tarapoto, so we bought some fruit for the journey and had a leisurely breakfast. There was a sweltering swampy heat that this Georgia boy felt right at home in, but by the time the sun peaked in the sky, Bibi was suffering. We tried to stay hydrated and took a nice dip in the river in the afternoon, but it wasn´t nearly enough. When we rolled into Pongo, Bibi was badly dehydrated, something I´m not sure she had experienced to this extent in her life. I went out for food and found a Chifa in town, but they had nothing on their menu but chicken and rice. I got some to go and headed back to the hotel room where Bibi was waiting. On the way, an English speaking con man begged me for money, pitching a story about a robbery, having to get to Lima, etc. I threw him a few soles, and then, feeling ashamed, I bought some plantain chips from the local women who had witnessed me waste my money on this tipo. I brought the loot back to Bibi in the hotel room, and we went to bed early. Throughout the night, I was waking up nearly every hour to down liters of water at a time. I got Bibi to drink as much as she could stomach, but her entire body was shutting down from the heat. By 5am, I was ready to go. Neither of us had slept well, and I wanted to make sure we were in the mountains before the heat of the day. She sucked it up and was right behind me, but was in a bad state. Immediately after leaving Pongo, we began climbing. Up-up-up all morning until we reached a tunnel at the peak, somewhere around 1000m of elevation. The cool air, while a shock to our system, was a welcome change. For the first time in Bibi’s life, villagers were shouting “hey gringa” and “ello mister” at her, which would be a source of laughter for us the rest of the trip. I’ll confess I enjoy it a lot more when the shouts were directed at my Colombian girlfriend and not at me. On the other side of the pass, we looked down at Tarapoto from above, and waited out a rainstorm in a restaurant. A kid had a few thousand questions for me about my bicycle gear, electronics, music, which I tried to answer, until I realized that every answer would just lead to another question and bailed on him. When the rain cleared up, it was time for our decent. 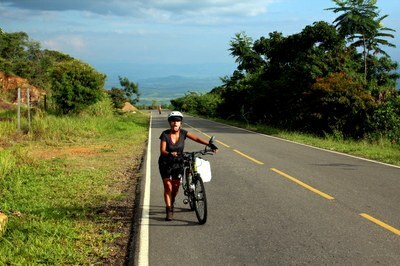 The ride down to Tarapoto was a glorious downhill stretch, which dropped about 800m over the next 12 kms. I went for maximum speed, passing a car and 3 motorcycles on the way down. I had faith that Bibi could handle this stretch without me at this point in the trip, but I still worried as soon as I reached the crossroads into town and had a 25-minute wait before she arrived. The video for this decent can be seen at the top of the page. We took a day of rest in Tarapoto as Bibi recovered from the previous days dehydration and I brought the blog up to date. We bought another sleeping bag for the journey, walked around town a bit, and took goofy pictures in the plaza. 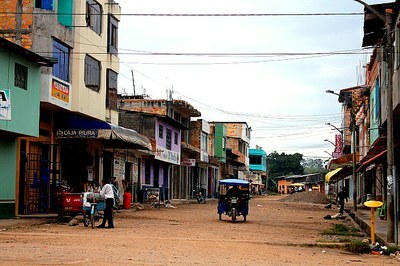 We didn´t find Tarapoto to be anything special, and the next day we set out for Lamas, just a short 25km away. The day to Lamas started out interesting enough. We were stopped on the side of the road by a TV crew who wanted to do a report on us. This had happened to me a few times, but it was the first time I had Bibi with me and it went a lot smoother. If I didn´t understand a question, she answered for me, and we generally had fun preaching the bicycle lifestyle on camera. El camino es la meta. Half way through the interview, I realized I had my video camera running as well, which I found amusing, and proceeded to do an interview on them (seen above). As you can see, I´m having way too much fun to interview effectively. The last 9 kms to Lamas was strait uphill. We would have much more difficult climbs on our journey, but this 500m ascent in the heat of the day just 3 days after an intense bout of dehydration was too much for Bibi. We ran out of water and I went on ahead to search for a pueblo that could fill our jugs. I knew she was in a bad way, and in too much of a hurry on a steep and unpaved downhill route, I had my first bad wipe out since Valledupar, Colombia. I broke my camera mount, and was sore. On the plus side, a group of young girls who had heard my crash and subsequent outburst of gringo profanity came running to see what all the fuss was about. Estoy bien, pero necesito agua para mi novia. They complied, and I slowly walked back up the hill to meet Bibi who was waiting in the shade at the crossroads. 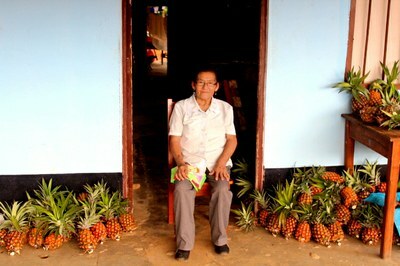 As we pulled into Lamas, we passed an old woman with hundreds of pineapples sitting on her porch and decided it looked like a nice place to take a breather. I asked if the pineapples were for sale, and she immediately took to cutting them up and serving us until we could eat no more. We talked about pineapple cultivation and her daughter in Miami. I told her about Armando hunting bears in Canada and that pineapples always remind me of home. For whatever reason, Bibi and I both remember the pineapple lady right away whenever we´ve back in the people we met along the way. She was sweet, and they were good piñas. We immediately liked Lamas and decided to stay put the following day to explore, despite my realization that we were not moving nearly fast enough to pull off the trip that I planned. There is no reason to worry about making good time on a bicycle. If you want to go faster, take a bus, I told myself. I had my first Peruvian ceviche that night, its deliciousness only outdone by its size. Ceviche in other countries does not compare. Even at Mar y Sol. 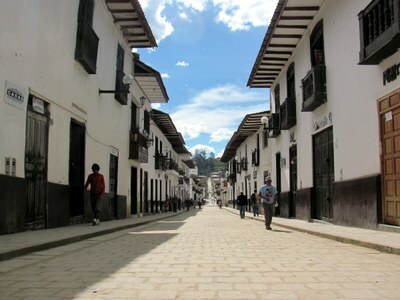 The next day we cabbed over to an indigenous village next to the town--empty more or less, with only a couple artisan shops open in the main plaza. We admired some odd coffee mugs, and struck up a conversation with the owner, who before I knew it was demonstrating a form of wrestling practiced during Carnival. He definitely took me off guard. The belt he strapped around my stomach was shockingly tight, and by the time I realized that I was going to be struggling to breath, he grabbed hold of it and was immediately trying to throw me to the floor. I got the idea. I wasn´t ready to go all in with this little man in the middle of his store. 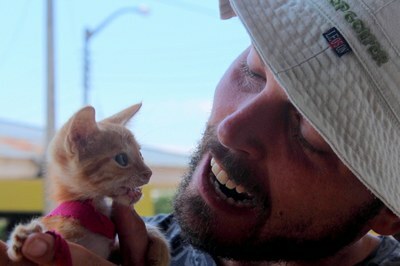 We also found this little kitten, tied with a ribbon to a rock. He and I sang a song together. Next we made our way over to this castle, built by some rich European whose dream, I suppose, was always to own his own medieval castle. 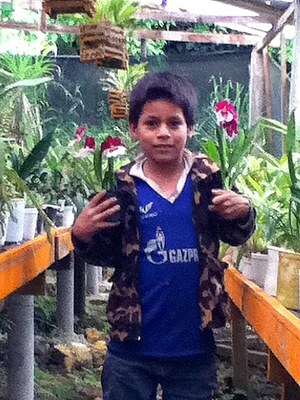 So he came to Ecuador to cut labor costs. I still don´t know what made this guy tick, but evidently he built a complete replication of some French castle in the middle of town, lived in one side, and sold tours on the other. Despite being a little turned off by the extravagance of this guy, we had a fun afternoon gallivanting around the place. Yes, the economist in me knows its been a good thing for the pueblo--construction costs, which must have been immense, tourism, etc. People all over the north of Peru knew this place. Still. Of all the things you can do with your money. A castle in Lamas? Really? We left before the sun came up the following day, and had our first day in a real rhythm. 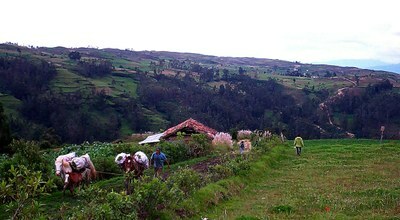 A nice 20km downhill as the sun was coming up over the valley, campesinos leading their animals to the fields. This was the first time I saw Bibi look comfortable on the downhill stretches. I had my GPS running and had her speed at nearly 45 kms/hr, and though she was too focused to crack I smile, I think she enjoyed this ride as much as I did. 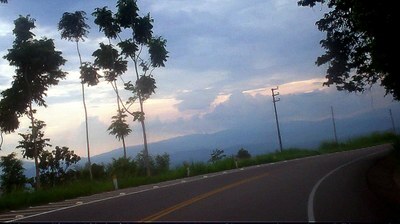 Late in the morning I stopped to wait for Bibi on a climb at the gate of a finca. Before I knew it the owner was outside, an old man, offering me a freshly cut coconut. I couldn´t refuse, but there was a catch. He would proceed to lecture me about the cigarette I was smoking for the next 15 minutes until Bibi arrived, only to repeat the story to her as she enjoyed her own coconut, nodding all along in agreement. Something about his son, a smoking/gambling, addiction. In the end it all worked out I think, but both Bibi and I are fuzzy on the details. That night we stopped just 15 kms short of Moyobamba in a tiny pueblo as the sun was setting. We were close to our goal that day, but there was a woman with chicken kebabs on the side of the road and a hostel right next door, and well, I was weak. Bibi was ready to push on. I believe it was the first time she was pushing to go further when I was ready to put on the brakes. It wouldn´t be the last. We´d done over 90kms that day, with no help from the mountains. When we arrived we met a German cyclist who was staying in our hotel. He asked us how our experience was with the autodefensa we’d passed earlier in the day. He used the Spanish word autodefensa which literally means self defense, but it called to mind very different images in Bibi’s mind and my own. The first thing that I called to mind was Benjamin Franklin early American militias. For Bibi it was paramilitaries in Colombia. The reality was probably something else all together. The people in this area wanted additional defense set up to keep drugs from being smuggled along this road from the jungle. There was nothing secretive about the checkpoint we passed through. Though interested in these three foreign bikers, we weren’t who they were looking for. That night we slept on the most uncomfortable mattress of our trip. I think it must have been stuffed with chicken feathers and cardboard. It´s incredible how easy it is to get a good night sleep after a good days work. 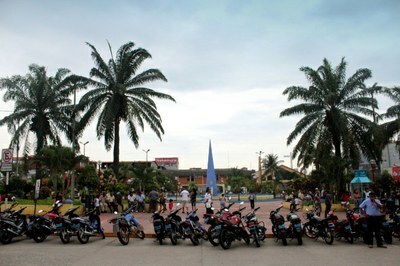 It was an easy ride into Moyobamba the next morning, but we decided to stay the night anyway and hit the thermal baths. After a round of internet updates, we cabbed over and soaked in the hot water. In Peru, doctors must be recommending pregnant women to bathe in these hot springs because I would say nearly a third of the women their were with child. Don´t we have signs in the U.S. that say pregnant women and children under 6 shouldn´t be in the hot tubs? Or am I imagining that? We really liked our hotel in Moyobamba, but I was itching to go the next morning. I still had my heart set on making it to Huaraz. We had a full ride that day, and ended up in a little town called Naranjos. In addition to widespread coffee and corn production, we made another observation this day. 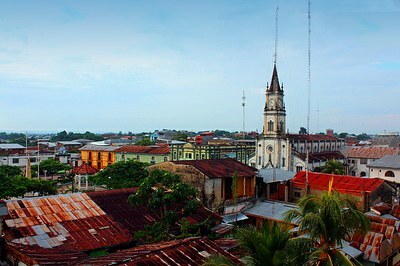 In most of the pueblos I´d visited along, the town would have one Catholic church in the central plaza. But all of a sudden there was a strong evangelical presence. The difference between Catholic towns and Evangelical ones is that the Catholic towns have just the one extravagant church that can be seen from anywhere in the valley, where the evangelical towns have 3-5 competing with each other, each run out of the spare room of a house. We peaked in on a few. They pass out plates, praise Jesus, and sway from side to side in Pentecostal fashion. Perhaps this should seem obvious, but I´d never really thought about the manner in which churches compete. In the U.S. we´re used to different denominations. Each person has their own way of worshipping, and we don´t think of it as competition. In most of Latin America, the Catholic church has a monopoly. But here you would have a town with no more than 50 people, and 4 churches, all blasting religious music trying to outdo the church across the street. And if that level of active competition exists in such a little town, how high was the turnover rate? I mean, everyone must be switching churches each week as if they were restaurants. It was all very weird. We made it to Naranjos, and promptly got sick again, Bibi first, and then me as well about 6 hours later. Still, if I was going to be sick in a little town in north Peru, I was glad to be lying in bed with her, watching bad action movies. We hunkered down the next day, fighting off fevers and soar throats, and were off again the following morning. After a good morning ride out of Naranjos, the weather started to turn on us. In this segment of the trip, villages were few and far between. We were no longer able to find restaurants, but resorted to asking around until someone could provide us with a hot meal. In the absence of a plate of chicken and rice, tuna and crackers were becoming a staple in our diet. Around 3 in the afternoon, we were flagged over to a finca by a man (Bibi assures me named Aroldo Arista Mas) who wanted to chat with us. We talked politics a great deal, and Bibi and I learned a lot about the important and controversial Peruvian president Fujimori. We all agreed that politics is an issue of deciding when to do what’s right for the country and when to do what’s right for the individual—when to be Machiavelian, and when to be humanitarian. We also took note of the mining fever that we had seen sweeping across Peru. Aroldo was sure that he had natural gas or oil on his property, evidenced by vents that expunged flammable air. 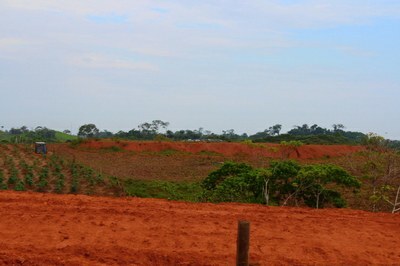 He hoped that I knew gringo mineral excavators that might want to purchase his property. I told him I knew no such people. As we sat and talked with him, we watched as the rain began to come down harder and harder. But it was just rain after all, and it had become clear that we were handling the rain better than the sun. 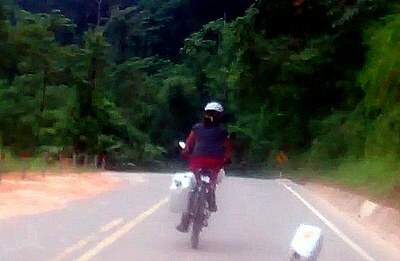 I turned down his offer to stay the night at his finca, hoping to push onwards and cover a little more ground that day. It was a bad call. After an hour of driving rain, we were soaked to the bone, cold, and with no pueblo on the horizon. 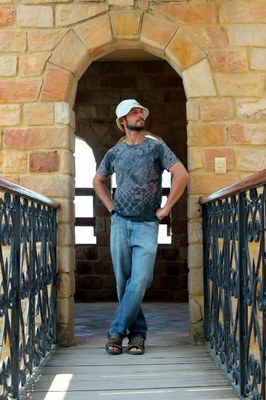 Around 6, we were delighted to find a lookout point, which featured a roof and a concrete base. We pitched our tent huddling together to keep warm. It rained again that night, and by morning, everything we owned that wasn´t already soaked from the previous day was now dripping in water. Moreover Bibi’s camera was fried, as were our batteries. We found ourselves with 5 cameras between us and none of them working. You will note a marked drop in the quality of photos from here on out. With spirits dampened and an extra 10lbs of water in tow, we pushed on the next morning. We made it over the pass we´d been slowly climbing the past day and after a modest decent, found a pueblo called Buenos Aires in the early afternoon and decided we´d call it a day. 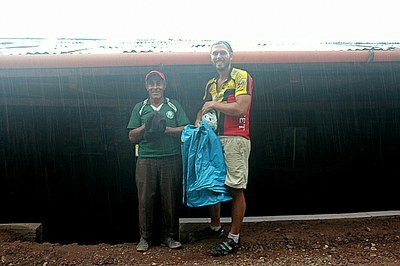 It was the first hostel we´d seen in 2 days and we wanted to get dry. After finding a clothes line to hang out everything we owned, Bibi took a nap, while I got escorted out to an orchid garden by the little chap you see below and his drunken but well meaning grandfather. 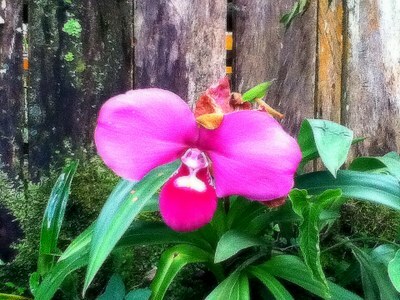 They showed me a wide range of orchids and exotic plants, one of which moved on its own accord. When you touched this thing, all the leaves around the point of contact would recoil, as if the plant was playing dead. Really cool stuff. After the tour was complete, I woke Bibi up and did the whole thing again with her. That evening, as Bibi rested in our room, I loaded up some water balloons with this kid and his cousin, and we headed up to the roof to celebrate Carnival by hurling them at strangers. A 5-year old girl had nearly knocked me off my bicycle earlier that day with a water balloon shot square in the chest, and I was looking to exorcise my shame onto someone else. It turns out there are rules to this game. My first shot was at a doctor, but I was immediately reprimanded for this. Doctor, doctor, they screamed. My next was at a kid about 17 years old. ¨Are you gay? ¨ they asked me. Well no. Then you have to throw at girls. Fine, I thought. Good to know. I took aim at a middle aged woman and as I was preparing to fire, again they screamed no no no!! That’s my mom!! I resorted to firing at the two of them until I was out of ammo. I don´t remember there being nearly so many rules to this game when I was younger. From Buenos Aires, we had a short climb to a significant pass. Somewhere in the vicinity of 3000m (10,000 feet). Near the top, there was a beautiful high elevation lagoon, and we stopped in for a surprisingly good lunch. Then down we went. Although we´d been in Peru since the jungle, this decent cemented it in my mind. This was the Peru I´d always imagined. Machu Picchu landscapes with nothing but undeveloped green all around us. The scope of these valleys were unlike any mountain range I´d ever seen. I would race down switchback after switchback, then pause to take it all in while I waited for Bibi who was still not nearly comfortable flying around these turns at high velocity. Throughout this decent, there were no villages, and I was glad we were going down this side. What took us two hours to descend would have taken us 2 days to climb. We got to the bottom, and it was hot again. Pedro Ruiz was a mere 800m above sea-level. We loaded up on Sporade, a sports drink we´d both become quite addicted to. It was also here that we rediscovered Sparkies. We came to terms with the fact that, after all the climbing we´d done, we were now back at the elevation we´d started at, with 1500m of climbing to do before reaching Chachapoyas, our next destination of note. We hit a crossroads and veered off in the direction of Chacha. Suddenly we were following a river, surrounded by incredible red rock formation. Conditions were perfect. More or less flat, in the shade of the enormous peaks on either side of us, great roads, and no traffic. We made another 40kms that afternoon to clock our highest daily total to date –96 kms. When things started to get steep, we were told of an Argentinian who ran a hostel up the road. Here we found Jorge, who was not in fact Argentinean, but had an Argentinean wife. At any rate, he was our guy. What he offered was a mattress on the floor, payment optional. My sleep was met with frantic crazy dreams, and evidently snored and mumbled throughout the night. Bibi didn´t sleep until the early dawn, and when she explained it was my snoring that had kept her awake, I held off our departure until late in the morning when she awoke. We said goodbye to Jorge, loaded up our gear, and climbed 800m to Chachapoyas in the heat of the day. 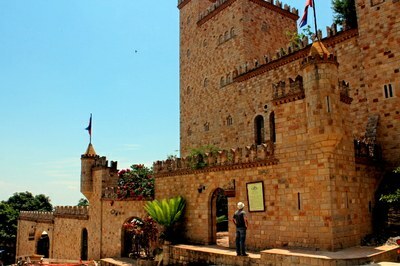 When we arrived, we were overjoyed at having reached our destination. It had been a long while since we were anywhere that resembled a city. Here I finally conceded that we were not going to make it to Huaraz, that we would have to cut the trip short to meet Johannes back in Quito, Ecuador to help with the final customizations for the launch of MLS-Ecuador on the 24th of Feb. I rerouted us in my mind, and when I was confident once again that we had a feasible schedule, we settled in for a 3-day break to recover from the journey. Following a day of R&R, empanadas(which did not meet the Colombian standards of my lady) and two liters of a passion fruit liquor drink in the plaza, we were ready for some action. 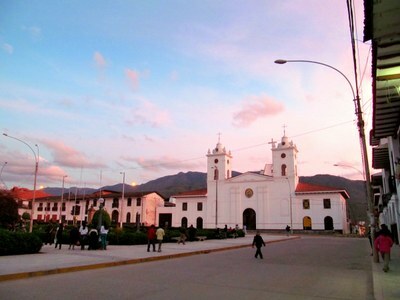 Chachapoyas is located right in the heart of a region that was heavily inhabited by both the Incas, and the preceding pre-Colombian civilization, the Chachas. We wanted to see what all the fuss was about, so we signed up for what I believe was my first proper ¨tour¨ during my entire trip. At 8am, we hopped on a bus, and headed out for a day trip to visit some caves and a burial site guarded by what Bibi and I referred to as ¨las caras.¨ The van was full of Peruvian tourists, many of whom were university students from Lima. 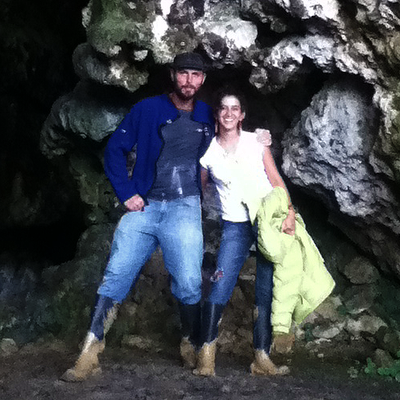 After an hour drive, we arrived at the entrance to a cave, and stumbled around in the dark, observing bats, stalagmites, and getting ourselves covered in mud. Bibi and I took pride in ourselves and our confidence, wandering ahead of the group, groping in the dark for footing, while a handful of girls squealed and whined behind us. I didn´t find the caves to be anything special, given my one and only epic caving experience with Melissa´s friend Tanny in north Georgia in which I very nearly died. That didn´t stop us from having a ball, but it was ¨las caras¨ that we were there to see. 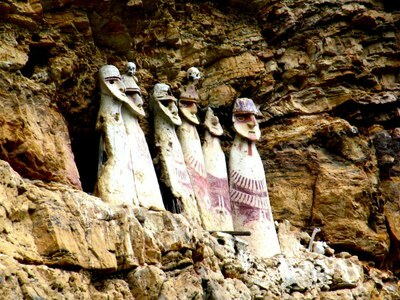 We stopped for lunch, and then back in the van, we made route to this cliff-side sarcophagus. The tomb was once the resting place for a Chacha emperor who had decided the normal burial rights weren´t good enough for him. He wanted something more extravagant, so he instructed his people to place his mummy in a cut on the side of a cliff, guarded by 7 sculptures (two have since shattered). After a short hike through a very remote village, we arrived and squeezed 2 or 3 pictures out of our dying cameras. On the way back to the van, we chatted with a young campesino woman. We were humbled by the challenges of her life: 11 children at a young age, carrying heavy loads from her fields to the village up a steep incline without help from a burro or horses. Perhaps she thought the same about ours when we told her we were crossing these mountains by bicycle with 40 kilos of gear. She spoke kindly with Bibi about her family and lifestyle, and gave us information about transport in the area. We returned to Chachapoyas in the evening, and treated ourselves to a delicious lasagna. The next day, we ran errands, loading up for the next 300km stretch to Cajamarca which would take us over two 3500m passes all along an unpaved road that was not wide enough for two cars to pass in opposite directions. 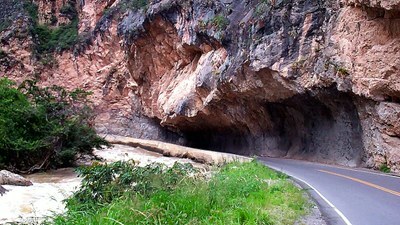 This would be my first experience on this kind of road, and we really didn´t know what to expect. I purchased an extra tire for emergencies, trash bags to protect us against future downpours, a quarter kilo of peanuts, and 12 bags of Sparkies. The rest had done us good. Next stop Kuelap.